“I mean successful - but that is rock star stuff” was the comment made by a reader about the chateau once owned by Jacques Louissier when it featured here last year. Which started me thinking about a series of posts showcasing the houses of famous classical musicians. But the problem is that despite - or perhaps because of - rock star salaries there is very little information in the public domain about the homes of contemporary classical musicians. 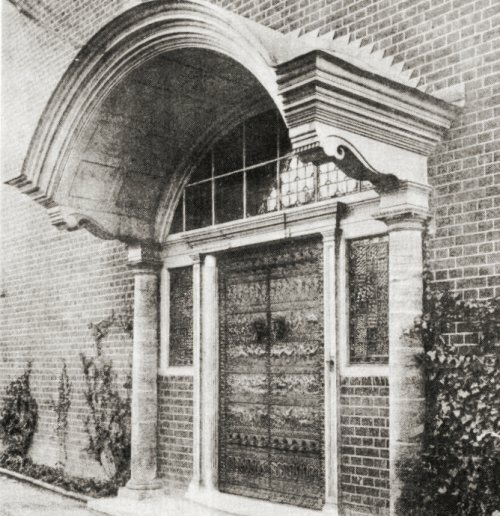 So this occasional series is kicking off with the house that Elgar built; or actually didn’t build, because Severn House, 42 Netherhall Gardens, Hampstead was constructed in 1888 for the celebrated portrait artist Edwin Long and extensively refurbished for the composer before he took up residence in 1912. The front doors of Severn House with their brass panels depicting men in armour are seen in the header photo. The house was demolished in 1937 so all we have are archive photos which I have digitally enhanced. 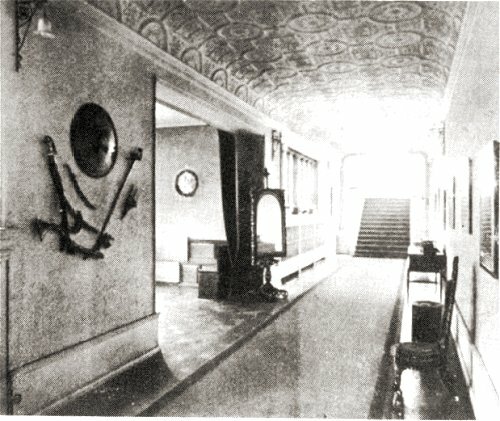 However, despite the poor quality of the photos, we can see this is rock star stuff Victorian style with the mahogany panelled entrance hall with a Carthaginian mosaic floor leading into the sixty foot long picture gallery seen below. A grand flight of stairs led to an orientally-themed drawing room with a marble fireplace, and to the the imposing music room seen below. 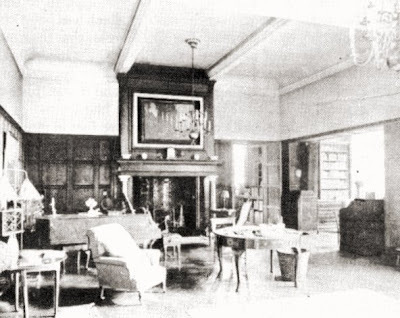 The music room was created from the original artist's studio, and had a billiard room leading off it. Below is a sketch of Severn House by Pauline Collett whose excellent but out-of-print book Elgar Lived Here this article draws on. The music Elgar composed at Severn House matched the grandeur of his surroundings and included The Crown of India, The Music Makers, Falstaff, incidental music for The Starlight Express, and The Sanguine Fan. But, despite his opulent lifestyle, Elgar’s time at Severn House was not idyllic. The outbreak of war in 1914 caused him financial problems, and the composer spent more time at the modest rented cottage in the Sussex countryside where he composed his Cello Concerto - a masterwork that eclipsed all the music written among the pomp and circumstance of his London home. In 1919 a burglary at Severn House unsettled Elgar and prompted him to put the house on the market for £7000. But it proved difficult to sell and the Elgar’s were still living there when the composer’s wife died in 1920. Severn House was finally sold by auction in 1921, and Elgar moved to a small apartment in central London before returning to his native Worcestershire where he died in 1934. As mentioned previously Elgar composed the incidental music for The Starlight Express at Severn House, and there is more on the links between that play and the occult Hermetic Order of the Golden Dawn in my post Elgar and the occult. Information on the homes of rather more contemporary musicians will be gratefully received. Meanwhile, here is an exclusive look at Benjamin Britten’s somewhat less opulent birthplace. 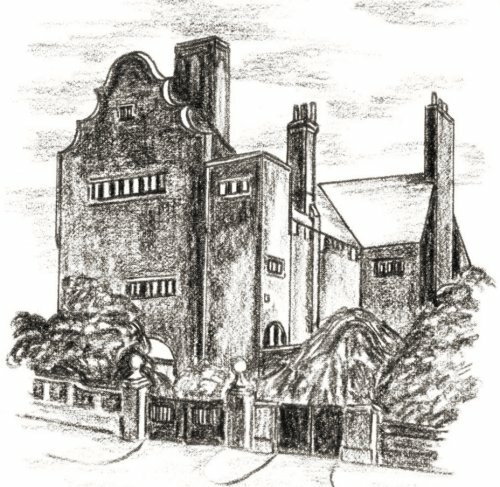 Sketch of Severn House credit Elgar Lived Here by Pauline Collett. Any copyrighted material on these pages is included as "fair use", for the purpose of study, review or critical analysis only, and will be removed at the request of copyright owner(s). Also on Facebook and Twitter.